The Hillsborough County, Florida, energy-from-waste facility-operated by Covanta Energy-currently produces 30 MW and is undergoing an expansion that will see it produce approximately 47 MW. (The post-expansion facility is pictured.) Photo courtesy of CDM. Rising landfill costs-as well as increases in energy prices-are fueling renewed interest in energy-from-waste, and Covanta Energy stands ready to expand its well-established network of facilities, which currently produce 7,800 gigawatts of renewable energy. Each year thousands of acres of land are lost to landfills in the United States. That figure will only continue to rise as the country's population grows. Unfortunately, the bad news doesn't stop there. Methane produced from decomposing waste is a potent greenhouse gas-over 20 times more powerful than CO2. And the costs associated with using a landfill are rising as cities and counties truck their waste ever farther away-sometimes over state lines. Reasons like these, and others, are causing municipalities to re-evaluate the benefits of energy-from-waste (EFW) facilities. Some municipalities are considering new facilities and others are looking at expanding the ones they have. Covanta Energy of New Jersey is well aware of the growing interest. A leader in the industry, the company runs 31 EFW facilities in the U.S., processing about 15 million tons of municipal solid waste annually and producing 7,800 gigawatts of renewable energy (enough to power all the homes in Philadelphia). Recently, the company has responded to two proposals for new facilities, has expanded a facility in Lee County, Florida and is currently expanding another one in Hillsborough County, Florida. "One of the last greenfield projects that was put into operation was our Montgomery County, Maryland facility, which came on line in 1995," says Derek Porter, the company's director of corporate communications. "Essentially, there were no new facilities built over a 10-year-period-until our two expansions in Florida."
. Controlled Costs and Long-term Disposal Options: Land-filling in densely populated areas, particularly Florida, is very costly, and there's no way to know what the price will be three, five, or 10 years from now. "Even if the municipality owns its own landfills, they don't want to fill them up quickly with raw municipal solid waste," says Porter. "With EFW facilities, counties can extend the remaining disposal capacity in their existing landfill by as much as 20 times, and can also retain control of their long-term solid waste disposal options and create predictable disposal rates."
. Revenue from Energy: With renewable, alternative energy at the forefront, people are looking for ways to provide significant energy from non-fossil fuel sources. EFW facilities, like Covanta's, can produce about 80 MW and run 24/7, providing a reliable source of renewable energy. Approximately 10 percent of energy produced is used to power the facility; the remainder is then available for sale to utility companies or on the free market.
. Elimination of Greenhouse Gases: No methane is produced at an EFW facility. "Although, no new facilities today have been built to offset greenhouse gases, the subject is in the forefront, and people are starting to recognize EFW facilities as an excellent way of mitigating harmful GHG emissions," says Porter.
. Expansion without Rate Hikes: Many facilities were built in the late 1980s or early 1990s, and often financed with public money in the form of 20-year bonds. As the bonds are paid off, municipalities can now choose to either lower the solid waste disposal rates they've charged customers or use the bonding capacity that has been freed up to expand their EFW facilities while keeping customers' rates the same. "It's a great incentive," says Joseph Treshler, vice-president of business development for Covanta. "It's exciting to see our clients, local government staff, be able to go to their governing board and say: 'We can expand the capacity of our solid waste management system and cover our needs for another 15 to 20 years. And by the way, we don't have to increase the disposal rates to our ratepayers.' It's a great position to be in for county staff or board of county commissioners."
. Expansion Ready: Many of the original EFW facilities were designed with growing populations and future capacity expansion in mind.
. Easy Urban Interface: Unlike landfills, EFW facilities cause no odor and don't attract rodents or birds. They also have a very small footprint. Porter reinforces this last point. "I'm actually working at one of our facilities in Alexandria, Virginia, which is across the street from a Washington D.C. metro station. There are some very expensive townhomes on the other side of this facility and we don't receive any complaints." 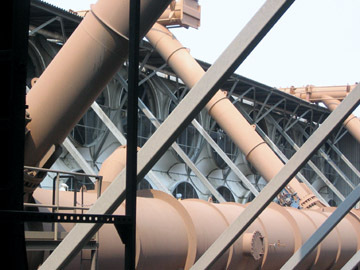 Condenser fans on the roof of a Covanta energy-from-waste (EFW) facility. Covanta is a leader in the industry, running 31 EFW facilities in the U.S., processing about 15 million tons of municipal solid waste annually and producing 7,800 gigawatts of renewable energy. But maybe one of the best reasons to consider an EFW facility is that municipalities across the nation have been successfully operating them for over 20 years. The process is proven and fairly straightforward. Municipal solid waste is deposited into a refuse pit and an industrial crane feeds the waste into specially designed combustion units equipped with integral boilers. Each combustion system has a unique grate system to help burn/combust/process the waste efficiently. "Most of them employ the German-made Martin GMBH grate system," says Porter. The combustion process reduces the volume by over 90 percent. The energy produced is used to power the facility and the remainder is sold. The remaining ash, which represents less than 10 percent of the original waste volume, is commonly used as landfill cover or landfilled. Covanta has added an extra step prior to landfilling-pulling out all the ferrous metals. "Essentially the ash is passed by a big magnet that pulls out these magnetic metals," says Porter. And Covanta pulls out a sizable amount. "We recycle about 360,000 tons of ferrous metal a year, enough to make approximately 270,000 cars. That's metal that would have sat in a landfill if it hadn't come to one of our facilities." Several facilities have also added non-ferrous metal recovery to capture the aluminum, brass, copper and other non-magnetic metals that have escaped the communities' recycling efforts. Covanta doesn't see itself as a recycling competitor, but as a recycling promoter. "Communities that have EFW facilities have a higher recycling rate on average compared to communities that don't," Porter says. "In the U.S., communities that have EFW average 33 percent recycling rates compared to the national average of 28 percent." Despite EFW's wide use, there hasn't been much new technology centered on EFW since the Clean Air Act was enacted in the 1990s, when facilities installed advanced air pollution equipment. But the lack of advancements may be because EFW was ahead of its time. "We've always been heavily regulated," says Porter, "And we have been far advanced and out in front of other combustion industries, like coal-fired electric power plants, with the technology we currently have in operation." But that doesn't mean there haven't been any breakthroughs. Covanta announced in February that it had developed two new technologies that represent major advances in controlling nitrogen oxide (NOx) emissions and improving energy efficiency. Both technologies are tested and ready for full-scale commercial application. In short, the technology will allow existing EFW facilities to cut NOx emission well below U.S. EPA requirements. And when coupled with selective non-catalytic reduction (SNCR) systems, will drop NOx emissions to approximately half of current regulatory limits. "This is particularly important in the heavily populated areas of California and on the east coast of the U.S. where these oxides of nitrogen are a precursor to ozone and this low-lying ozone causes smog," says Porter. Whether municipalities incorporate their new NOx control technology or not, Covanta sees expansions as the wave of the future. The current Hillsborough County, Florida, expansion may turn out to be typical of what's to come. 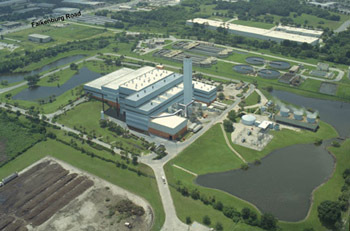 Hillsborough County's EFW facility was originally designed by Covanta to handle 1,200 tons of municipal solid waste per day. The County is currently having Covanta expand the facility to process 1,800 tons a day, by adding a single, 600 ton-a-day combustion unit. "There was space laid out in the original footprint," says Covanta's Joseph Treshler. "Originally the County had envisioned a future 400 ton-a-day expansion. But they decided to put in the largest unit they could fit into the confines of the design and take advantage of economies of scale." The Hillsborough EFW facility currently produces 30 MW and after the expansion will produce approximately 47 MW. About 5 MW will be used to meet the internal needs of the facility with the remaining available for sale to Tampa Electric. Covanta originally built the facility in 1987 and was granted a 20-year operating agreement. In 2007, it's somewhat of a repeat-Covanta will handle the expansion and the County granted Covanta a second 20-year operating agreement. "We're on a 28-month construction schedule," says Treshler. "We started driving pilings in June and the expansion is scheduled to be completed in April 2009." The facility will only need a small addition to its existing operating staff to cover the operation of the new expansion unit, but the construction staff is expected to peak somewhere around 250 people, which should give the community a positive boost. As expected, many contractors will be involved. 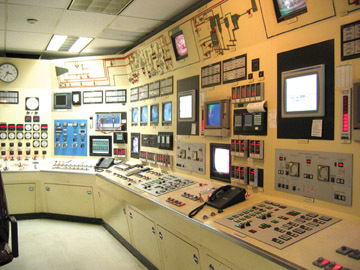 The major ones include: Sauer Inc. as general contractor; the boiler and erector supplier is Babcock Power; and the air pollution control system supplier is Alstom Environmental System. The turbine generator is manufactured by Siemens and the architect engineer on the project is DMJM & Harris. Despite all the work, the end product will be hard to spot. "The way the facility was originally laid out, the combustion unit fits into a slot in the back of the building. Others things that you wouldn't be able to notice are an additional cell on the cooling tower and a side-by-side switchyard to tie into the new generator. From the outside, people won't even notice anything has changed," says Treshler. Porter believes that expansions like these will be the first wave, and will be followed by new greenfield infrastructure, partly because so many of the EFW facilities were built with expansion in mind and it makes financial sense to add to those first. "The new EFW facilities will probably be centered along the East Coast or where the population densities are the highest. Just recently we heard that Los Angeles County, California is looking at EFW options," says Porter. "Even Hawaii has a new EFW proposal planned. I think we're right on the verge here. Municipalities are going to start really looking at their overall long-term integrated waste programs again."